Foods and Nutrition Department, Faculty of Family and Community Studies, M.S. University of Baroda, Vadodara-02, Gujarat, INDIA. Aegle marmelos (L.) Correa (AM) leaf has been used as a remedy for lowering blood sugar level in traditional system of medicine in India due to the presence of various constituents such as flavonoids, tannins and alkaloids like Aegelin, Marmelosin and Luvangetin. 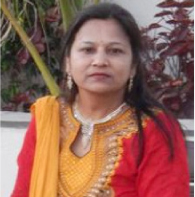 The objective of the present study was to evaluate the total antioxidant activity of the wild variety of AM leaves from forest of Gir Somnath, Gujarat, India and cultivated variety from Central Horticultural Experiment Station, Vejalpur, Panchmahals, Gujarat to assess the role of this plant in ethanomedicine in India. The methanolic extracts of the leaves were screened for total antioxidant capacity through Ferric Reducing Antioxidant Potential (FRAP) and 1, 1-diphenyl-2-picrylhydrazyl (DPPH) radical scavenging assay; Total Phenol content (TPC) through spectrophotometric technique based on Folin Ciocalteau assay and for qualitative estimation of phenols, High performance Liquid Chromatography (HPLC) was used. TPC of wild and cultivated variety was 7.6% and 6.5% respectively. FRAP values and IC50 value (DPPH) for wild and cultivated variety were found to be 14.65 μmol/l and 11.80μmol/l; 437 μg/ml and 620μg/ml respectively. Wild variety was found to be superior to the cultivated one. This study proved that the leaves of AM leaves have high antioxidant component. AM could be used as a potential preventive intervention for free radical mediated diseases such as diabetes and as neutraceutical in medicinal formulation. Further intervention trials are needed to prove the therapeutic potential of these leaves. The importance of natural antioxidants for use as food additives or nutritional supplements has already been established.1 Antioxidants or ingredients having antioxidative properties are used extensively for improvement of food stablity. The search for safe and effective naturally occuring antioxidants is now focused on edible plants especially spices and herbs.2 Extracts from spices, herbs and hulls are reported to exhibit varying degrees of antioxidant activity.2 Some of the common spices have been evaluated and further scrrening of medicinal plants for their antiradical properties is of interest primarily to find out newer sources of natural antioxidants, functional foods and nutraceutical. Aegle marmelos (Bael, AM), is a deciduous sacred tree, associated with Gods having useful medicinal properties, especially as a cooling agent. Bael is a subtropical tree but grows well both in tropical and sub-tropical climate upto an altitude of 1219m. No drug has been longer and better known nor more appreciated by the inhabitants of India than the bael fruits.3 Charaka in Ayurveda describes the plant as a Rasayana, besides its other actions and uses.4 The importance of bael tree is highlighted in Yajur Veda, Buddhist and Jain literature - ‘Upavana Vinod’, ‘Brihat Samhita’ and ‘Charaka Samhita. Biochemical compounds of bael leaves, fruits and seeds have been used in several diseases like diabetes, cardiovascular and anti-inflammatory.13 Aegeline (N-[2-hydroxy-2(4-methoxyphenyl) ethyl]-3-phenyl-2-propenamide) is a known constituent of the bael leaf and consumed as a dietary supplement for a variety of purposes.14,15,16 The objective of this study was to evaluate the antioxidant potential and free radical scavenging activity and total phenol content of wild and cultivated genotype of Aegle marmelos to prove the therapeutic claim of the plant. Sample for the cultivated variety, (a newly developed spineless variety named “Goma yashi”) was procured from Central Horticultural Experiment Station (CIAH), Vejalpur (Godhra), Panchmahal-389340. Sample for the wild variety was collected from the Gir forest region (21004’49.7” N 70035’10.6” E). Fresh leaves were thoroughly washed to remove unwanted material and dirt and then dried under shade. They were then dipped in 1% HgCl2 solution for a min and then dried on a filter paper, they were then identified and authenticated by Associate Professor of the department of Botany, M.S. University of Baroda, Vadodara. A voucher specimen of the leaves (herbarium no. F.N.V.G. /I and II) was prepared and preserved in the department of herbarium (Figure 1 a and b). The shade-dried leaves were then powdered using an electric mixer and used further for antioxidant capacity using FRAP, DPPH and total phenol content (TPC) assays. All samples extracts were then prepared in solvent (80:20 methanol water). Quantitative and qualitative estimation of polyphenols was performed to develop a polyphenol profile for each sample. Quantitative estimation was carried out using spectrophotometric technique based on Folin Ciocalteau assay using the standard solution of Gallic acid (GAE). The phenolic content in the samples was calculated from the standard curve and expressed as mg GAE/g dry extract. The standard curves for TPC plotted for various concentrations for both the variety have been discussed in Figure 2 a and b. For qualitative estimation of phenols HPLC analysis was selected. Standardization of the assay was carried out by preparing standard curve using 0, 50, 100, 150, 200, 250mg/l solutions of Gallic acid in methanol: Water (80:50, v/v). Elution was done at a flow rate of 1ml/min. Reducing power and radical inhibiting property were analysed by FRAP and DPPH. Dissolve 1 g of dried sample in solvent (80:20 methanol water). Shake it for 30 min in magnetic shaker or water-shaker bath. And add 20 ml of solvent to the Supernatant. Again, shake it for 30 min. Centrifuge and separate supernatant. Make volume up to 50 ml with the help of the solvent. Antioxidant Power (FRAP) assay, FRAP assay measures the change in absorbance at 593 nm because of the formation of a blue coloured Fe II-tripyridyltriazine compound from colourless oxidized Fe III form by the action of electron donating antioxidants. Antioxidant capacity was measured using the Ferric Reducing Antioxidant Power (FRAP) assay (Benzie and Strain 1996).17 The standard curve plotted for various concentrations is depicted in Figure 2 c. The FRAP value in μmol/l was calculated by simple comparison of 0-4 min change in absorbance at 593nm of the test sample and that of a standard FeSo4 calibrator, as follows-(0-4min difference at 593nm of test sample/0-4min difference at 593nm of standard) × FeSo4 standard (μmol/l) Calculation was done through regression analysis. Equation used was: y = 0.6173x + 0.2264. The resultant values were expressed as μmol Fe(II) per litre of the samples. Where Acontrol is the absorbance of the control (L-Ascorbic acid) and Atest is the absorbance of reaction mixture samples (in the presence of sample). All tests were run in triplicates (n=3), and average values were calculated. All the chemicals used were of analytical grade from Merck and Hi-Media. 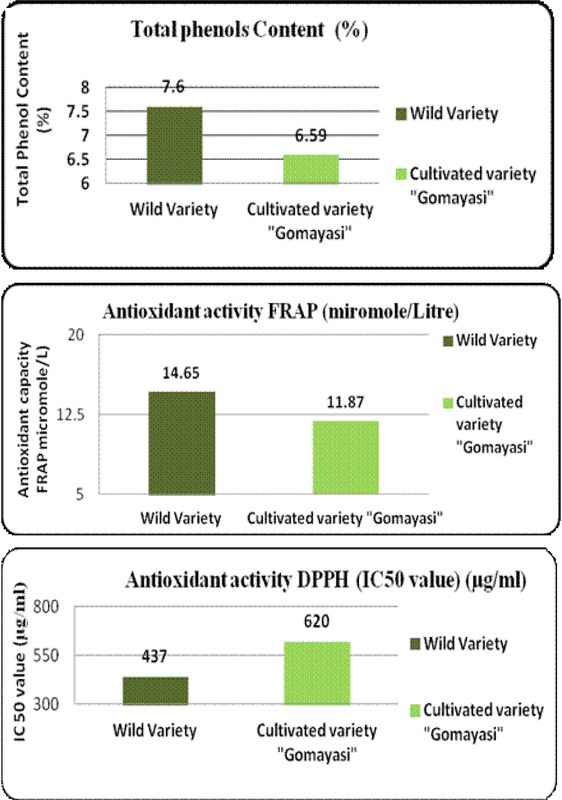 The Standard curves for DPPH (IC50 values) content of Wild variety and cultivated variety are given in Figure 3 (a and b) and antioxidant activity is given in Table 1 and Table 2. Aegle Marmelos leaves from the wild and cultivated variety were evaluated for their total and individual phenol content, antioxidant capacity using DPPH and FRAP methods. TPC is used as indicators of overall antioxidant activity of the herbal drugs. Poly phenols have been recognized to show medicinal properties and exhibit physiological activity. The TPC of AME was tested by Folin–Ciocalteu method with gallic acid as standard. TPC of wild and cultivated Aegle Marmelos leaf samples were 76 mgGAE/g and 65 mg GAE/g of dry extract which came to be 7.6% and 6.56% respectively Table 5. TPC of wild variety was more than cultivated variety. a-Image of cultivated variety (Gomayasi) leaf and b-Image of wild variety of Aegle marmelos leaf. (a-Standard curve for TPC (Wild variety), (b-Cultivated variety), c-standard curve for the FRAP assay. a-Graph showing IC50 value of cultivated variety. Figure 3: b-Graph showing IC50 value of Wild variety. HPLC analysis for quantification of individual polyphenol revealed the presence of gallic acid, chlorogenic acid and Ferullic acid in wild variety whereas gallic acid, Ferullic acid and pyrocatechol was found in cultivated variety. 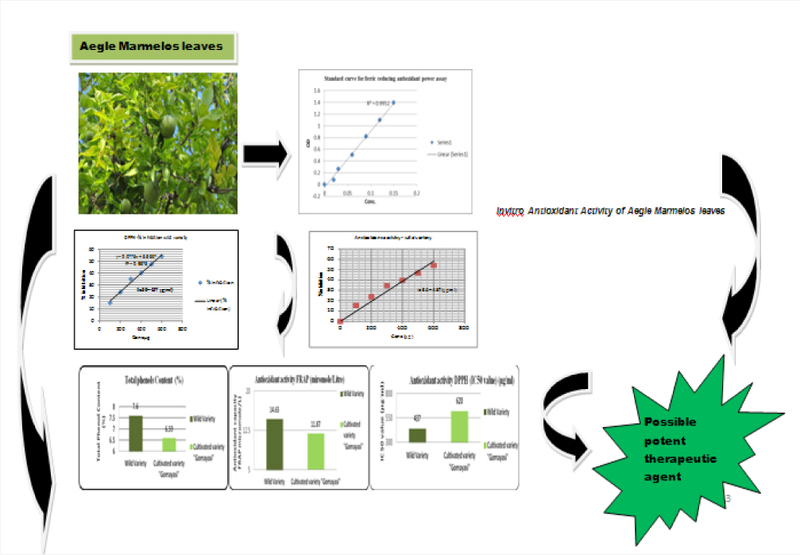 Figure 4 (a and b) describes the HPLC analysis chromatograms and details of the HPLC analysis of wild and cultivated Aegle marmelos leaf samples is given in Table 3 and 4. Free radical reducing power as assessed by FRAP was 14.65 μmol/l and 11.80μmol/l for wild and cultivated variety of Aegle marmelos leaves respectively Wild variety showed slightly higher reducing power (FRAP) as compared to cultivated variety. DPPH activity expressed as IC50 value (μg/ml) for wild and cultivated variety was 437 μg/ml and 620μg/ml respectively (Table 5 and Figure 5 a, b and c). A perfect correlation was observed between TPC, FRAP and DPPH assay values. A positive correlation between TPC and FRAP was seen (1) whereas negative correlation (-1) between TPC and DPPH and between FRAP and DPPH was marked. Wild variety is having more antioxidant capacity than the cultivated one (437 μg/ml<620μg/ml) as can be seen from Table 5. On comparison with a study in which AM leaf extract was done using Folin–Ciocalteu method with gallic acid as standard, TPC of the AME was found to be 1118.12±79.19 mg GAE/100 g of dried material which was lower than the values found in our study.19 The TPC over 500 mg GAE/100 g is considered as a high category antioxidant activity. A- chromatogram for the wild variety. B- chromatogram for the cultivated variety. a-TPC, b-FRAP and c-DPPH of Wild and cultivated variety of AM Leaves. Results of the phenolic compounds and total antioxidant activity of Aegle marmelos leaves. The antioxidant property of the water and methanolic leaf extracts of 3 different phenotypic traits at four different concentrations were studied using FRAP and DPPH. Out of the three different traits studied the traditional small 3 leaves showed maximum DPPH activity and Iron chelating activity (FRAP) in all concentrations.22 As Aegle marmelos is rich in antioxidant, it can be used as food additives to delay the oxidative deterioration of foods and as neutraceutical in medicinal formulation against degenerative diseases. Aegle marmelos can be used as a natural antioxidant, antipyretic, antibiotic and immunomodulatory drug.24 It can also be used as a remedy for diabetes as it contains aegelinnosides A and B isolated from Aegle marmelos(L.) Correa leaves as alpha-glycosidase inhibitors. Of the compounds isolated, anhydroaegeline revealed the most potent inhibitory effect against alpha-glycosidase with IC50 value of 35.8 Mm.25 This result support ethno pharmacological use of A. marmelos as a remedy for diabetes mellitus. Wild variety showed slightly higher reducing power (FRAP) as compared to cultivated variety. FRAP values of our study were compared with various extracts of medicinal plants samples. These values were in the range of 1.07±0.15- 3.70±0.11 mmol Fe/100 g of fresh weight. Our samples were analysed in dry powdered form and showed high FRAP values. Calculating for fresh weight (Moisture content-53%) the FRAP values turned out to be 28.75 mmol Fe/100 g of fresh weight of wild variety and 23.16 mmol Fe/100 g of fresh weight of cultivated leaf sample. In another study evaluating antioxidant activity DPPH of AM leaf extract, the IC50 values of DPPH was 160.47 μg/mL which was more than our values.20 Table 5 shows total antioxidant content, TPC and Individual Phenolic composition of the wild and cultivated varieties of Aegle marmelos leaves. The lower the IC50 value, higher is the antioxidant capacity of the sample. HPLC analysis for quantification of individual phenolic compounds revealed the presence of gallic acid, chlorogenic acid and ferulic acid in wild variety whereas gallic acid, ferulic acid and pyrocatechol in cultivated variety. From the results, gallic acid present in appreciable quantities in Aegle marmelos (L.) Correa might be responsible for its efficient in vitro antioxidant property. Gallic acid has been shown to inhibit cell proliferation in prostate cancer cells. Chlorogenic acid contains anti-cancer, antimicrobial, anti-LDL (bad cholesterol) and antiviral properties. Aegle marmelos leaves have exhibited high phenol content, rich polyphenol profile and strong antioxidant capacity. The antioxidant potential is attributed to its polyphenol content. These phenols also provide myriad protective actions. Further studies are required to identify the specific active principles of the plant for this significant antioxidant effect as well as human intervention trials are warranted as to study the beneficial effects on humans, for knowledge about molecular basis of these effects. The Aegle marmelos (L.) Correa leaf samples from wild variety of Gir forest and cultivated variety from Vejalpur research station Panchmahals, Gujarat, India were evaluated for their antioxidant activity using total phenol content (Folin-ciocalteau assay), Ferric Reducing Antioxidant Potential (FRAP-Benzie and Strain, 1996) and 1, 1-diphenyl-2-picrylhydrazyl radical scavenging assay (DPPH-Brand and William et al, 1995) and qualitative estimation of phenols using High performance Liquid Chromatography (HPLC). The analysis showed that TPC of wild and cultivated variety was 7.6% and 6.5% respectively, FRAP values and IC50 value (DPPH) for wild and cultivated variety were 14.65 μmol/l and 11.80 μmol/l; 437 μg/ml and 620 μg/ml respectively. HPLC analysis for quantification of individual polyphenol revealed the presence of gallic acid, chlorogenic acid and Ferullic acid in wild variety whereas gallic acid, Ferullic acid and pyrocatechol in cultivated variety. Thus it can be used as potential inhibitor of free radicals. As the wild variety was having more antioxidant capacity than the cultivated one, it can be exploited further for its therapeutic application. Further human intervention trials are warranted as to study the beneficial effects on humans, for knowledge about molecular basis of these effects animal and cell model studies are required. Appreciation to University Grant Commission and The Maharaja Sayajirao University of Baroda for support in the form of grants for conducting this research study. Conflicts of interest CONFLICT OF INTEREST Both the authors wish to declare that there is no conflict of interest. Bassiounny SS, Hassanien FR, Ali F, El-Kayati SM , authors. Efficiency of antioxidants from natural sources in bakery products. Food Chem. 1990;37(4):297–305. Cross Ref. Shoba FS, Thomas M , authors. 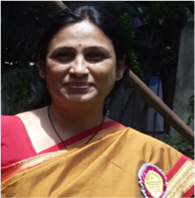 Study of antidiarrheal activity of four medicinal plants in Castor oil induced diarrhea. J Ethanol. 2001;76(1):73–6. Cross Ref. Martello D, Bianchi N, Borgatti M, Lambertini E, Piva R, Jabbar S , authors. In vitro antiproliferative effects on human tumor cell lines of extracts from the Bangladeshi medicinal plant Aegle Marmelos Correa. Phytomedicine. 2003;10(4):300–8. Cross Ref. Keyword: Our study highlights the total antioxidant activity of cultivated and wild variety of Aegle marmelos(L.) Correa leaves under various in vitro models and how its natural origin and potent free radical scavenging ability could be used as a potential preventive intervention for free radical mediated diseases and as neutraceutical in medicinal formulation against degenerative diseases like diabetes. Wild variety of leaf was somewhat superior to cultivated variety in their antioxidant activity.